This weeks cider review comes from Flushing Michigan’s finest: Almar Orchards. Almar is one of the few certified organic apple orchards in southeast MI. Using integrated pest management the Koan family grows over 30 apple cultivars on their 500 acre farm. They also raise grains and livestock including pigs which feed on spent apple pomace after pressing! All of the apples used to make J.K.’s Scrumpy Hard Cider are grown, harvested, pressed, and fermented on the farm. “This Original Hard-Cider has been made on our family-owned farm in Flushing, Michigan for well over a hundred years. It was first pressed back in the 1850’s. Not much as changed in the process since then. We use the same apples from the same orchards as my great-great grandfather did before the time of the Civil War. We are proud of that. It gives us a sense of history…. “I consider Orchard Gate Gold as a unique Artisan Michigan Farmhouse Cider, somewhere between English Scrumpy and a Normandy Cidre. The bottom line is that it could not be made anyplace else. It is reliant on the soil and the climate. Open a bottle and decide for yourself! Orchard Gate Gold and the rest of the J.K.’s Scrumpy cider line are readily available throughout MI and can be found in 17 other states. Orchard Gate Gold is sold for around $8.99 and weighs in at 6% ABV. Upon pouring the cider is hazy and lacks clarity. Bits of yeast and lees float in the bottle. It has a beautiful golden straw color and the aroma grabs you immediately—it’s somewhere between butterscotch and caramel with the aromatics common of fresh apple juice. The flavor is reminiscent of apple juice left in the fridge to slowly ferment for a month or two. It is very sweet with high residual sugar and has virtually zero sharpness or bitterness. What I’d call a dessert cider. The booziness distinctly pulls through and complements the nearly overbearing sweetness. This cider is certainly not sparkling but it does posses a subtle effervescence— I believe it’d be referred to as a perlant cider. The slight bubliness adds a pleasant mouth feel that also supports and balances the high sweetness. For a sweet dessert cider it is very agreeable and nice, but for me, drinking more than a glass would be too much. I’d imagine Orchard Gold Gate would be lovely served warm and mulled. Stay tuned for coming reviews of other ciders in the J.K.’s Scrumpy Hard Cider line. Cheers! My enthusiasm for cider drinking, cider-making, and everything involved in the culture of cider, is ever expanding and one resource that’s been monumental for me is The New Cider Maker’s Handbook by Claude Jolicoeur. Being a noob to the cider making world, I am beyond grateful to have this gem— and from what I can tell this is perhaps one of the most comprehensive guides to date. The book is beautifully put together with rich text and loads of high quality photographs and diagrams adding even more clarity. Claude has won awards for his craft ciders and takes a detail oriented approach to sharing his deep understanding of the processes involved in making high quality cider. The book covers both the scientific and practical aspects of the process, such as measuring gravity with a hydrometer, testing the acidity of your must, choosing the right yeast strain, and blending apple varieties to make the type of cider you’re after. He outlines the techniques for making sweet or dry cider, sparling or still cider, and even Québec’s finest: ice cider! Varietal blending chart from The New Cider Maker’s Handbook. With some 70 gallons of cider fermenting in my basement this year, I’ve constantly been turning to the book as a reference. Claude explains potential challenges in the process making troubleshooting a breeze. What Claude has offered to the cider community is invaluable; The New Cider Maker’s Handbook is a crucial resource for beginner cider makers and will offer a range of tips, tricks, and new ideas for the advanced cider maker. 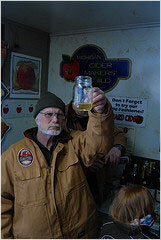 Visit Claude’s website to learn more about his cider brilliance.